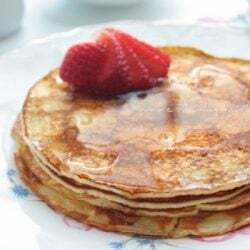 These delicious low carb cream cheese pancakes taste like skinny fried cheesecakes! They can also be made without sweetener and rolled to make delicious keto wraps! Put all ingredients in a blender or magic bullet. Blend until smooth. Pour 1/4 of the batter into a hot pan greased with butter or pam spray. Serve with sugar free syrup (or any syrup of your choice) and fresh berries. Your net carbs may vary depending on the brand of cream cheese you use. Look for a brand of cream cheese that only has 1g carbs per ounce.